Raise Baihui. Sit upright. Withdraw vision and slowly close eyes. Relax the head, chest and back, waist and legs. Relax the whole body. Relax wrists and turn palms upward. Riase the arms to the top of the head, with two palms facing the top of the head. Pour qi down and put qi inside the body. Continue to lower the arms and put qi inside the head. Think of qi going inside the body while pouring qi down. Place your hands near the area where qi is needed. Pour qi in quietly and make qi abundant. If qi and blood flow smoothly, no disease would appear and all diseases would dissipate. The functions of organs and all structures return to normal. Do the circular motion with hands near the sick area. During the circular motion, think that you rub the qi inside. Think of the area inside and think that qi is flowing smoothly there. Think of the circular motion inside the sick area and qi would go inside. Diseases dissipate. You should think seriously that you are now a healthy person. Think that your diseases have gone and the functions of your organs have returned to normal. Gather qi inside the body, to the area where qi is needed. Pour qi inside, quietly and with full attention. Qi goes inside and becomes abundant. 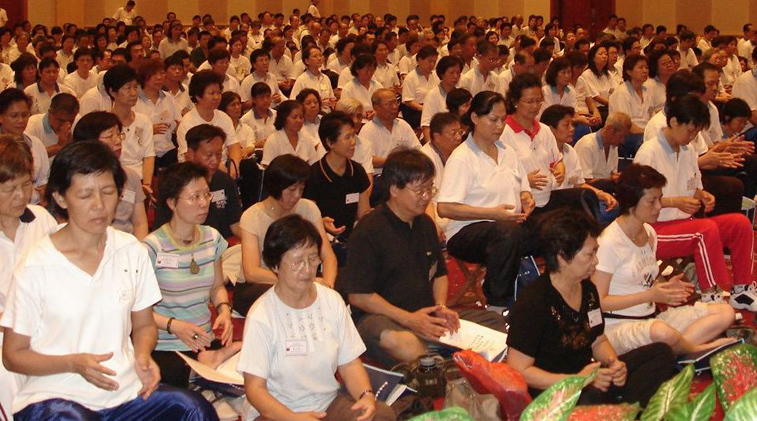 When qi is abundant and qi flows smoothly, diseases would get cured. Use your consciousness actively to gather qi inside and make diseases dissipate and the body healthy. Qi and blood inside the head are abundant and flow smoothly. All the diseases inside the head dissipate. Qi and blood inside the chest including heart and lungs are abundant. Diseases dissipate. Qi and blood inside abdomen are abundant and flow smoothly. Diseases dissipate. Qi and blood of the limbs are abundant and flow smoothly. Diseases dissipate and functions return to normal. Qi and blood of the whole body are abundant and flow smoothly. Diseases dissipate. Diseases dissipate. The functions of different areas return to normal. Put your hands down. Last text: The focus of qigong is to investigate life and its laws. Next text: How to apply qi therapy after qi pulling?